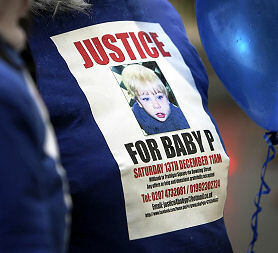 A judge issues minimum jail terms ranging from three to 10 years for causing or allowing the horrific death of Baby Peter, as a review finds the child could have been saved. Sue Turton reports. The mother of Baby Peter has been sentenced to at least five years in prison for her role in the death of the 17-month-old boy. The judge described her as "manipulative and self-centred" and said her priority had been her relationship with her boyfriend, not her son. That boyfriend - who also cannot be named for legal reasons - has been jailed for 12 years. Peter suffered more than 50 injuries before he died, despite being on the child protection register. This morning a second Serious Case Review has criticised all the agencies involved, saying Baby Peter's death "could and should have been prevented". While Baby P's mother, her boyfriend, and their lodger Jason Owen, were being sentenced by a judge a serious case review was being published which says there were many more people who failed to step in. Baby Peter could have been taken into care before he was killed. Today's report says there was enough evidence someone was hurting him. But there wasn't a sense of urgency among social workers. In the eight months Baby Peter was on the child protection plan, and GPs and hospital doctors were finding scratches and bruises his case still was regarded as routine - "with injuries expected as a matter of course". When police and social workers did ask for a meeting with Haringey council's child protection lawyer, it was delayed for more than a month. And then it was decided Baby Peter was not at enough risk to apply to take him into care. Today's report says Baby Peter's injuries were so serious they did meet the legal threshold to try to remove him from his family. That was 8 months before Baby peter died. But, today's report says, social workers in Haringey were too willing to believe his mother. They took her word for it when she told them her new boyfriend wasn't living with her. She was arrested twice in the year before her son died, when doctors found injuries on the baby. But the police investigation went no further. "We accept that things went badly wrong with our child protection services in 2007. This review clearly shows there were failings by all the agencies involved with Baby Peter. There were opportunities to help this family which should have been taken. I apologise for those failings." Today's report says social workers missed the abuse baby Peter was suffering, .but they also missed the significance of his mother's own abuse as a child - and the impact that had on her ability as a mother and her ability to manipulate them. Responding to the sentences Haringey council says it's making urgent, substantial improvements to its children's services.